InterTradeIreland has published research into firm-level patterns of risk exposure to examine how the capacity of firms to absorb shocks can be assessed. The organisation is also enhancing its Brexit support for SMEs. In 2016 InterTradeIreland commissioned a comprehensive research programme to understand how firms in both Northern Ireland and Ireland may be impacted by changes in the cross-border trading environment post-Brexit. Previously published research in the series examined the impact of WTO tariffs on cross-border trade, the level of integration of supply chains and the tangible benefits to exporting across the border in terms of turnover, employment levels and productivity. 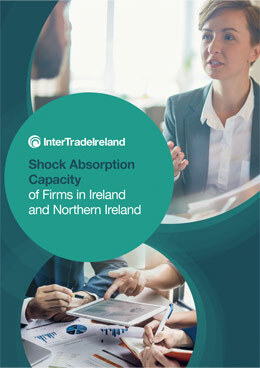 InterTradeIreland has now released the fourth research project, which uses detailed, firm-level patterns of risk exposure to examine how the capacity of firms to absorb shocks can be assessed. Combining our shock absorption capacity indicators, which are based on firm turnover and profitability, with information on cross-border and EU trade flows, provides insight into how prepared firms are to deal with a post-Brexit scenario that involves increases in the cost of trading across the border. In Northern Ireland just over 50 per cent of goods firms are in an “at-risk” group. This figure sounds eye-opening. To be clear this means that around half of the firms have at best, a mediocre ability to absorb shock, ranging to a very low ability. At the more extreme end, 5.5 per cent of goods firms are considered to be extremely vulnerable to any post-Brexit fall-out. Those firms that are considered “low-risk” account for just over a quarter of goods firms (26.5 per cent) in Northern Ireland. These are likely to be bigger and therefore will be larger employers. In terms of firms in the services sector, the pattern for the most vulnerable is broadly similar as the goods sector. Those in the most exposed or “highest-risk” category stands at 5.8 per cent. In fact, the research shows that, even more so than in goods, smaller firms in the services sector are the most vulnerable. Again, they will represent a smaller share of employment. North-South trade is quite dispersed across almost all levels of shock absorption capacity, meaning any major change to trading costs is going to be disruptive. It is worth noting that a large number of Northern Ireland’s goods imports from Ireland are from firms in “at-risk” categories with close to 50 per cent falling into the “higher-risk” category. This compares to 29 per cent of Irish good imports from the UK, that are in an overall “at-risk” category, suggesting that any equivalent-sized shock would have wider effects in Northern Ireland, with a greater share of firms exposed relative to Ireland. Moreover, close to a third (30.3 per cent) of Irish goods exports to the UK are in overall “at-risk” categories compared to 62 per cent of exports from Northern Irish goods firms to Ireland. We have enhanced our support package by adding a new element to our voucher funding which is focused on implementing plans to mitigate risk and chase opportunity. Trade between Northern Ireland and Great Britain and between Ireland and the UK is relatively highly concentrated in the “lower-risk” groups of firms. To illustrate, less than 10 per cent (7.8 per cent) of Northern Ireland goods export sales to Great Britain and 16.3 per cent of imports are undertaken by firms in the “higher-risk” categories. This suggests trade with Britain tends to be concentrated in firms with higher risk absorption. This research underlines the heightened exposure of small cross-border traders to post-Brexit trading relationships that involve cost increases. InterTradeIreland is responding by enhancing its Brexit support. While there is still a huge amount of uncertainty surrounding the outcome of Brexit, now is not the time to be complacent. Businesses can put measures in place to help them identify risks and opportunities. Now, InterTradeIreland has unveiled details of an enhanced Brexit Advisory Service, where businesses can secure up to £4,500 of funding, as well as benefit from a new bespoke online learning tool focused on practical help to prepare for Brexit. Aidan Gough, InterTradeIreland’s Designated Officer says: “Over 11,000 largely small businesses in Northern Ireland trade across the border. To assist them, we have enhanced our support package by adding a new element to our voucher funding which is focused on implementing plans to mitigate risk and chase opportunity. This article was written by Kerry Curran, Policy Research Manager, InterTradeIreland.